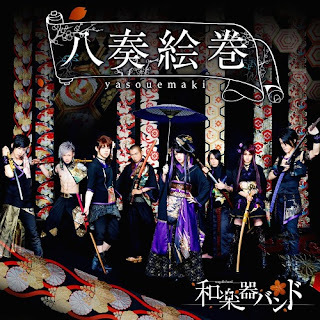 Yasou Emaki is the second studio album from Japanese rock group Wagakki Band. This eight-piece group comprises a lead singer, Yuko Suzuhana, and seven musicians playing a variety of contemporary and traditional Japanese instruments. While the band includes the likes of Machiya on guitar and Asa on bass, it also features the likes of Beni Ninagawa on the shamisen (a kind of three-stringed guitar), Kiyoshi Ibukuro on the koto (a sort of horizontal harp) and Kurona on the wadaiko (specifically Japanese drums). 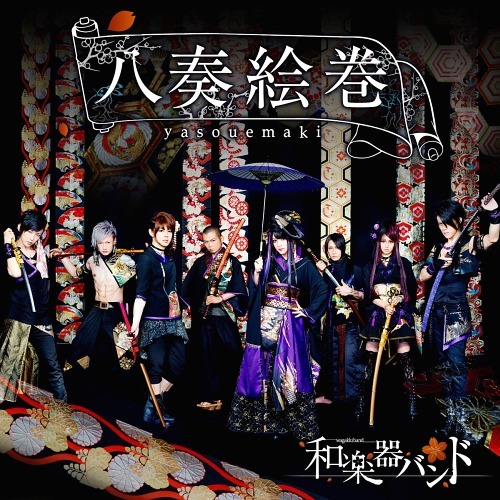 It is a striking blend that gives Wagakki Band a unique musical sound. In broad strokes it sounds like fairly typical Japanese pop/rock. In the fine details it sounds remarkably old-fashioned and highly evocative. The band's aggressive sense of fusion extends to their elaborate costuming, mixing outfits from feudal Japan with a vibrant and colourful punk identity. The album opens with the fast-paced rock song "Ikusa", which forms as good an introduction to the band as any. It combines Japanese-style pop/rock music with traditional Japanese instruments to achieve a very distinctive sound. That momentum is carried over the similarly strong "Hoshi tsuki yo". Suzuhana's voice really stands out in this second track, as she carries a single note up and down a particularly Japanese-sounding scale. "Perfect Blue" is a great showcase for Kiyoshi Ibukuro on the koto and Daisuke Kaminaga on the shakuhachi - a top-blown wooden flute. "Tsuioku" eases off a little on the album's breakneck pace - it's still a relatively fast song, but it cruises rather than races, and that makes for a welcome change after three pretty frantic tracks. Other songs like "Hanabi", "Shoromadara" and "Hangeki no Yaiba" feel a little too self-similar to make a proper impact. This is either a strength or a weakness: certainly it works perfectly well as long as you find yourself really enjoying Wagakki Band's sound. If you start craving variety you are likely to come away disappointed. "HAGANE" really pushes the more traditional sounds, coming across as a rocked-up version of a kabuki performance. It's a slower and heavier track, at least until it hits a slightly unexpected - but very welcome - chorus. The contrast works wonderfully. Similar work is done further down the album in "Akatsuki no Ito". "Furin no Utautai" is a slow ballad, something that I usually do not warm to, but this one is actually rather welcome as a chance for the album to slow down a little. A little down the line there's a similarly gentle song in "Nadeshiko Zakura" - both are well placed. "Kyosyu no Sora" features a change in vocalist from Suzuhana to lead guitarist Machiya. It's a pleasant change, but the song itself feels a little underwhelming. "Senbonzakura" is another standout, with a strong reliance on Ibokuro's koto and returning to the fast pace of the early songs. It is in songs like this that the balance between rock and traditional music is at its best. "Hanafurumai" keeps the pace going well in the album's final leg, although it does hew pretty closely to the album's general sound. Yasou Emaki wraps up with "Chikyu Saigo no Kokuhaku wo", with pretty much wraps up the entire sound of the album - the faster tracks, the ballads, and the contemporary and traditional sounds. It's an excellent send-off. Overall there is a tendency for the songs on the album to merge together into one big rolling track full of striking musical instruments and strong Japanese-language vocals. As noted above, this works so long as Wagakki Band's sound is one the listener enjoys. Personally I find it great background music, not necessarily to be listened to on its own merits but enjoyed while doing other things. For fans of Japanese culture they should absolutely be checked out and sampled: there's some exceptional talent at work here, albeit within a very narrow niche.